Vegas is rapidly evolving into a party scene unlike anywhere else in the world. From extravagant multi-level nightclubs, to dayclubs as legendary as the city itself. Reservations are mandatory for private tables, cabanas, bungalows, etc - and to skip the lines. For these Vegas parties, it's well worth the money — and inevitable hangover. Omnia was unleashed in 2015 and hasn’t stopped destroying the club scene since. One club to rule them all, the first thing you notice is the mesmerizing, kinetic chandelier with concentric rings that move to the music. The main room specializes in electronic music. And if you ever need a breather - or you just want to party outside, Omnia has a patio that offers a pretty unique view of Vegas. DJs: Calvin Harris, Kaskade, Zedd and Afrojack. The outdoor waterfall and pond make Intrigue one of the most quaint and beautiful clubs in Vegas. Thirty-six movie projectors paint the venue with colors and patterns that change from one night to the next. Within Intrigue, the Living Room is one of those rare VIP experience you cannot buy your way into. Reserved for members and guests only, the incognito lounge is accessed via a secret passageway from its Lakeside restaurant. It also guarantees what-happens-in-Vegas-stays-in-Vegas: photos and phones are strictly prohibited. DJs: Diplo, Lost Kings, Dillon Francis, Flosstradamus, Marshmello, and RL Grime. Marquee is hands-down one of your best nightclub bets on the Strip for consistently packed crowds. With three distinct rooms and an attached day club for outdoor fun. The dark rooms are surrounded by spacious leather booths which you can reserve with bottle service. Deep inside, you'll find Marquee's best room, The Library, complete with fireplace, book-lined walls, a vintage billiard table, and cocktail waitresses dressed as librarians. Marquee puts the focus back on the music, bringing in a never-ending lineup of world-renowned DJs. When it comes to drinks, there's no lack of options, with specialty cocktails from 7 different bars. DJs: DJ Vice, DJ Ruckus, DJ Mustard, DJ Chuckie, and Travis Scott. DJs: Tiesto, Steve Aoki, Kaskade, and The Chainsmokers. XS is as impressive as it is excessive. Rumored to be the most expensive club ever built at around $100M, the venue is inspired by the sensual curves of the human body. The illuminated outdoor pool and island bar will amaze even the most seasoned clubber, while the indoor VIP tables and outdoor VIP cabanas cater to the affluent. For a truly elite experience, sip on the $10,000 Ono Cocktail which combines Louis XIII black pearl cognac, Charles Heidseck’s 1981 Champagne Charlie, orange juice, apricot puree and rose nectar to very costly effect. Served in jewel-encrusted champagne glasses with a complimentary 18-karat Tahitian black pearl necklace and 18-karat gold genuine stingray leather Mont Blanc cufflinks, the Ono cocktail is a symbol of lavish excess synonymous with Las Vegas. DJs: The Chainsmokers, David Guetta, Alesso, Diplo, and Skrillex. Hyde is a spectacular indoor-outdoor nightlife venue with the most coveted location in Las Vegas: overlooking the Bellagio Fountains. The space itself is built on mystery and is said to have been the opulent Italian villa of a famed Renaissance artist, who tailored seductive grand festival masks. With an eclectic and refined taste, the artist fashioned his surroundings with worldly treasures, complemented by Italian marbles, reclaimed woods, lavish chandeliers, and towering glass doors that led to a secluded Tuscan garden. This is the villa that has been artfully brought back to life by visionary design icon Philippe Starck as Hyde Bellagio. A night at Hyde begins with an exclusive early-evening experience beginning at 5:00 PM highlighted by an award-winning mixology program and a menu of intriguing small plates from Lago. 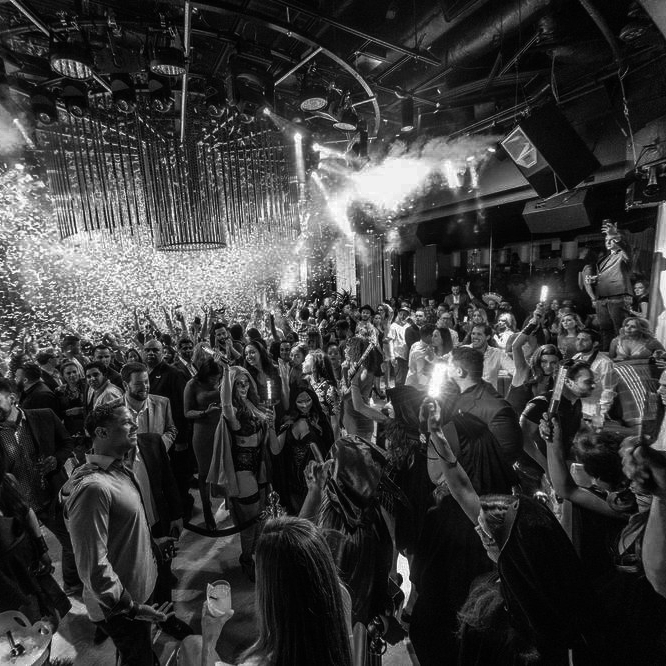 Long after the sun sets, Hyde Bellagio evolves into Vegas' hottest nightlife destination, with 40 VIP tables, a diverse rotation of DJs and live performances. DJs: DJ Hollywood, DJ Karma, D Miles, and DJ E-Rock. DJs: the Chainsmokers, Major Lazer, AfroJack, and Alesso are all in residence every weekend during summer. DJs: Calvin Harris, Tiesto, Zedd, and Kaskade.